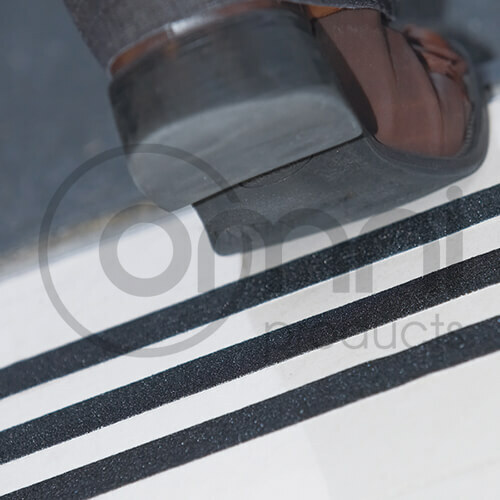 Omni Anti Slip Tread Tape has been specially designed to prevent slips, trips and falls. The tape has granular coating which, when applied on a surface, helps in maintaining traction and prevents people from slipping and falling. Several accidents at the workplace and elsewhere occur due to slipping. While some slips don’t cause injury, others may cause serious damage such as head and brain trauma, neck injuries, back injuries and fractures. To avoid such mishaps, we offer highly slip-resistant Anti Slip Tread Tape. It comes with an aggressive adhesive which allows it to bind to all kind of surfaces from steel and tiles, to concrete. Suitable for application both outdoors and indoors, the tape is ideal for use on ramps, walkways, staircases, and any other slippery surface. The heavy duty granular surface of the tape marks it out from all other adhesive tapes. Workplaces such as hospitals, manufacturing facilities, warehouses and schools can make use of this tape to keep the people on their premises safe and avoid any slipping hazards. The Anti-Slip Tread Tape is available in black colour. It is offered in two different sizes for the convenience of our customers.